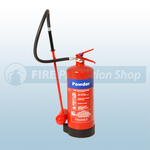 Our FireShield range of Specialist Dry Powder Fire Extinguishers are widely recognised and trusted, they have become well known for their high quality finish and reliability. 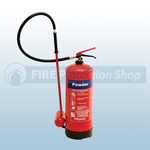 Being filled with Specialist Dry Powder makes these Fire Extinguishers a good all round choice for tackling fires involving combustible metals such as lithium, magnesium, sodium or aluminium. The types of risk the 9Kg M28 Dry Powder (D Class) Fire Extinguisher would cover is metal fires involving Sodium, Magnesium and Aluminium. This particular Fire Extinguisher will not cover you for Lithium. The types of risk the 9Kg L2 Dry Powder Fire Extinguisher would cover is metal fires involving Lithium.